A large quantity of Kepler's correspondence survives. Many of his letters are almost the equivalent of a scientific paper (there were as yet no scientific journals), and correspondents seem to have kept them because they were interesting. In consequence, we know rather a lot about Kepler's life, and indeed about his character. It is partly because of this that Kepler has had something of a career as a more or less fictional character (see historiographic note). nearby Leonberg with his parents in 1576. His father was a mercenary soldier and his mother the daughter of an innkeeper. Johannes was their first child. His father left home for the last time when Johannes was five, and is believed to have died in the war in the Netherlands. As a child, Kepler lived with his mother in his grandfather's inn. He tells us that he used to help by serving in the inn. One imagines customers were sometimes bemused by the child's unusual competence at arithmetic. Throughout his life, Kepler was a profoundly religious man. All his writings contain numerous references to God, and he saw his work as a fulfilment of his Christian duty to understand the works of God. Man being, as Kepler believed, made in the image of God, was clearly capable of understanding the Universe that He had created. Moreover, Kepler was convinced that God had made the Universe according to a mathematical plan (a belief found in the works of Plato and associated with Pythagoras). Since it was generally accepted at the time that mathematics provided a secure method of arriving at truths about the world ( Euclid's common notions and postulates being regarded as actually true), we have here a strategy for understanding the Universe. Since some authors have given Kepler a name for irrationality, it is worth noting that this rather hopeful epistemology is very far indeed from the mystic's conviction that things can only be understood in an imprecise way that relies upon insights that are not subject to reason. Kepler does indeed repeatedly thank God for granting him insights, but the insights are presented as rational. At this time, it was usual for all students at a university to attend courses on "mathematics". In principle this included the four mathematical sciences: arithmetic, geometry, astronomy and music. It seems, however, that what was taught depended on the particular university. At Tübingen Kepler was taught astronomy by one of the leading astronomers of the day, Michael Maestlin (1550 - 1631). The astronomy of the curriculum was, of course, geocentric astronomy, that is the current version of the Ptolemaic system, in which all seven planets - Moon, Mercury, Venus, Sun, Mars, Jupiter and Saturn - moved round the Earth, their positions against the fixed stars being calculated by combining circular motions. This system was more or less in accord with current (Aristotelian) notions of physics, though there were certain difficulties, such as whether one might consider as 'uniform' (and therefore acceptable as obviously eternal) a circular motion that was not uniform about its own centre but about another point (called an 'equant'). However, it seems that on the whole astronomers (who saw themselves as 'mathematicians') were content to carry on calculating positions of planets and leave it to natural philosophers to worry about whether the mathematical models corresponded to physical mechanisms. Kepler did not take this attitude. His earliest published work (1596) proposes to consider the actual paths of the planets, not the circles used to construct them. At Tübingen, Kepler studied not only mathematics but also Greek and Hebrew (both necessary for reading the scriptures in their original languages). Teaching was in Latin. At the end of his first year Kepler got 'A's for everything except mathematics. Probably Maestlin was trying to tell him he could do better, because Kepler was in fact one of the select pupils to whom he chose to teach more advanced astronomy by introducing them to the new, heliocentric cosmological system of Copernicus. It was from Maestlin that Kepler learned that the preface to On the revolutions, explaining that this was 'only mathematics', was not by Copernicus. Kepler seems to have accepted almost instantly that the Copernican system was physically true; his reasons for accepting it will be discussed in connection with his first cosmological model (see below). It seems that even in Kepler's student days there were indications that his religious beliefs were not entirely in accord with the orthodox Lutheranism current in Tübingen and formulated in the 'Augsburg Confession' (Confessio Augustana). Kepler's problems with this Protestant orthodoxy concerned the supposed relation between matter and 'spirit' (a non-material entity) in the doctrine of the Eucharist. This ties up with Kepler's astronomy to the extent that he apparently found somewhat similar intellectual difficulties in explaining how 'force' from the Sun could affect the planets. In his writings, Kepler is given to laying his opinions on the line - which is very convenient for historians. In real life, it seems likely that a similar tendency to openness led the authorities at Tübingen to entertain well-founded doubts about his religious orthodoxy. These may explain why Maestlin persuaded Kepler to abandon plans for ordination and instead take up a post teaching mathematics in Graz. Religious intolerance sharpened in the following years. Kepler was excommunicated in 1612. This caused him much pain, but despite his (by then) relatively high social standing, as Imperial Mathematician, he never succeeded in getting the ban lifted. Kepler's answer to these questions, described in his Mystery of the Cosmos (Mysterium cosmographicum, Tübingen, 1596), looks bizarre to twentieth-century readers (see the figure on the right). He suggested that if a sphere were drawn to touch the inside of the path of Saturn, and a cube were inscribed in the sphere, then the sphere inscribed in that cube would be the sphere circumscribing the path of Jupiter. Then if a regular tetrahedron were drawn in the sphere inscribing the path of Jupiter, the insphere of the tetrahedron would be the sphere circumscribing the path of Mars, and so inwards, putting the regular dodecahedron between Mars and Earth, the regular icosahedron between Earth and Venus, and the regular octahedron between Venus and Mercury. This explains the number of planets perfectly: there are only five convex regular solids (as is proved in Euclid's Elements , Book 13). It also gives a convincing fit with the sizes of the paths as deduced by Copernicus, the greatest error being less than 10% (which is spectacularly good for a cosmological model even now). Kepler did not express himself in terms of percentage errors, and his is in fact the first mathematical cosmological model, but it is easy to see why he believed that the observational evidence supported his theory. Kepler saw his cosmological theory as providing evidence for the Copernican theory. Before presenting his own theory he gave arguments to establish the plausibility of the Copernican theory itself. Kepler asserts that its advantages over the geocentric theory are in its greater explanatory power. For instance, the Copernican theory can explain why Venus and Mercury are never seen very far from the Sun (they lie between Earth and the Sun) whereas in the geocentric theory there is no explanation of this fact. Kepler lists nine such questions in the first chapter of the Mysterium cosmographicum. Kepler carried out this work while he was teaching in Graz, but the book was seen through the press in Tübingen by Maestlin. The agreement with values deduced from observation was not exact, and Kepler hoped that better observations would improve the agreement, so he sent a copy of the Mysterium cosmographicum to one of the foremost observational astronomers of the time, Tycho Brahe (1546 - 1601). Tycho, then working in Prague, had in fact already written to Maestlin in search of a mathematical assistant. Kepler got the job. Naturally enough, Tycho's priorities were not the same as Kepler's, and Kepler soon found himself working on the intractable problem of the orbit of Mars (((See Appendix below))). He continued to work on this after Tycho died (in 1601) and Kepler succeeded him as Imperial Mathematician. Conventionally, orbits were compounded of circles, and rather few observational values were required to fix the relative radii and positions of the circles. Tycho had made a huge number of observations and Kepler determined to make the best possible use of them. Essentially, he had so many observations available that once he had constructed a possible orbit he was able to check it against further observations until satisfactory agreement was reached. Kepler concluded that the orbit of Mars was an ellipse with the Sun in one of its foci (a result which when extended to all the planets is now called "Kepler's First Law"), and that a line joining the planet to the Sun swept out equal areas in equal times as the planet described its orbit ("Kepler's Second Law"), that is the area is used as a measure of time. After this work was published in New Astronomy ... (Astronomia nova, ..., Heidelberg, 1609), Kepler found orbits for the other planets, thus establishing that the two laws held for them too. Both laws relate the motion of the planet to the Sun; Kepler's Copernicanism was crucial to his reasoning and to his deductions. The work on Mars was essentially completed by 1605, but there were delays in getting the book published. 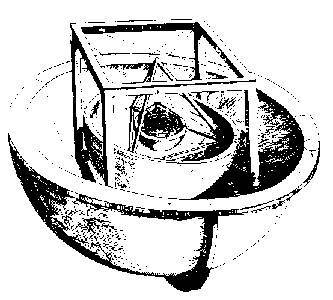 Meanwhile, in response to concerns about the different apparent diameter of the Moon when observed directly and when observed using a camera obscura, Kepler did some work on optics, and came up with the first correct mathematical theory of the camera obscura and the first correct explanation of the working of the human eye, with an upside-down picture formed on the retina. These results were published in Supplements to Witelo, on the optical part of astronomy (Ad Vitellionem paralipomena, quibus astronomiae pars optica traditur, Frankfurt, 1604). He also wrote about the New Star of 1604, now usually called 'Kepler's supernova', rejecting numerous explanations, and remarking at one point that of course this star could just be a special creation 'but before we come to (that) I think we should try everything else' (On the New Star, De stella nova, Prague, 1606, Chapter 22, KGW 1, p. 257, line 23). Kepler seems to have married his first wife, Barbara, for love (though the marriage was arranged through a broker). The second marriage, in 1613, was a matter of practical necessity; he needed someone to look after the children. Kepler's new wife, Susanna, had a crash course in Kepler's character: the dedicatory letter to the resultant book explains that at the wedding celebrations he noticed that the volumes of wine barrels were estimated by means of a rod slipped in diagonally through the bung-hole, and he began to wonder how that could work. The result was a study of the volumes of solids of revolution (New Stereometry of wine barrels ..., Nova stereometria doliorum ..., Linz, 1615) in which Kepler, basing himself on the work of Archimedes, used a resolution into 'indivisibles'. This method was later developed by Bonaventura Cavalieri (c. 1598 - 1547) and is part of the ancestry of the infinitesimal calculus. Calculating tables, the normal business for an astronomer, always involved heavy arithmetic. Kepler was accordingly delighted when in 1616 he came across Napier's work on logarithms (published in 1614). However, Maestlin promptly told him first that it was unseemly for a serious mathematician to rejoice over a mere aid to calculation and second that it was unwise to trust logarithms because no-one understood how they worked. (Similar comments were made about computers in the early 1960s.) Kepler's answer to the second objection was to publish a proof of how logarithms worked, based on an impeccably respectable source: Euclid's Elements Book 5. Kepler calculated tables of eight-figure logarithms, which were published with the Rudolphine Tables (Ulm, 1628). The astronomical tables used not only Tycho's observations, but also Kepler's first two laws. All astronomical tables that made use of new observations were accurate for the first few years after publication. What was remarkable about the Rudolphine Tables was that they proved to be accurate over decades. And as the years mounted up, the continued accuracy of the tables was, naturally, seen as an argument for the correctness of Kepler's laws, and thus for the correctness of the heliocentric astronomy. Kepler's fulfilment of his dull official task as Imperial Mathematician led to the fulfilment of his dearest wish, to help establish Copernicanism.